I've been swamped and it's good to finally be able to post some new art again and sat hello. Here's something I finished this evening. A class demo in acrylics for my visual development students. 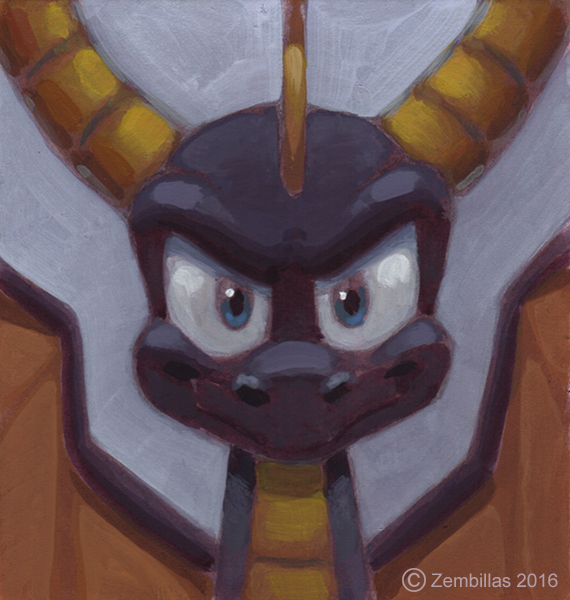 I thought I'd give Spyro a little love and attention by painting a portrait of him. This took 4 sittings. About 45 minutes to an hour each time. It's as far as I got. 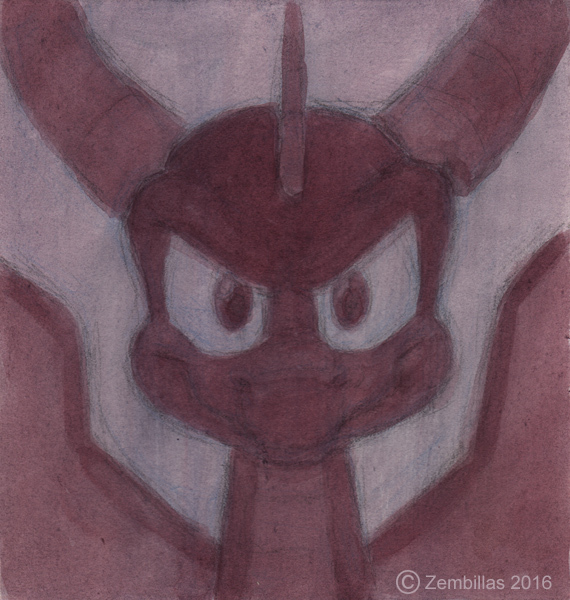 I've also included the underpainting to give an idea as to how it progressed. I hope you enjoy it. This was a lot of fun. Thanks for checking it and good wishes to you! That's a nice tribute to Crash you created. Thanks for posting it. I celebrated by being interviewed about the origin of Crash. The day of his 20th anniversary was well spent sharing my experiences and my opinion on things. It's always fun and a relief telling others what actually went down after 2 decades of misinformation. Joe Pearson deserves a lot of the creative credit as well as David Siller. Hope Crash does well for another 20 years. Crash fans are the best. Thanks! Yes, those people other do deserve the credit. I think heard a lot of shady things of the naughty dog staff dislikement of David Siller for almost reason. Say Charles did Joe Pearson design characters like Ripper Roo, Komodo Brothers, Tiny Tiger, Koala Kong, Dr Nitrus Brio and Dr Neo Cortex and maybe Crash? And took on from their? like he was the blueprints design guy? Yes that's true. Joe Pearson created the initial design concepts for the characters you mentioned plus you can add Pinstripe Potoroo to the list. He probably came up with the idea for the characters as well. He was at the heart of the development of Crash. I refined his concepts and made them work as characters that could be animated and I embellished their behavior. It was off of Joe's original ideas. I made it in Manga Studio 5 with a Bamboo Splash Small Tablet, it's not the best but I try to work with it as best as I can. Ah I see. I had a bit of an idea about some of those thing's so thanks for clearing it up. it's all ways good coming here for your art and crash history. I just hope Vicarious Visions that are making the remaster well stay true to you and Joe's concept's and not some thing those Promotional arts back in the naughty dog day's. Thank you Hazman. I think Vicarious will do a good job. They have a love for Crash. Gabriele that's an excellent rendition of Crash! I'm very impressed! Good drawing and I especially like the way you styled Crash. I may be influenced by your design in the future. I'm intrigued by the way you interpreted the character. Keep up the nice work! More significantly Gabriele it's influential. To be inspired is akin to motivating one to create. To be influenced is along the lines of wanting to imitate the art or the style of the art. When your art becomes influential then you're doing something special. This is an amazing painting of Spyro. This is how he should look in his current appearances (I'm pointing at you I Wei Huang). What do you think of how drastically they changed Spyro in Skylanders? I hate what they did to your purple dragon and so do a lot of fans yet Activision and Toys for Bob seem to not care. Thank you Barbocosta for your comments. Regarding the way Spyro evolved I don't know what to tell you. It's in the hands of other people. If they would have contacted me I'd be happy to do consultation and help them with making sure Spyro has good design appeal. But that's not how these companies work. They're very insular and they do things their own way. I have a question, I saw on IMDB that you designed some characters for the Super Mario World TV series in 1991. Is this true? If yes, who did you design? I'm also a fan of Super Mario so I was intrigued when I saw that. Yes I worked on Super Mario in 1991. I don't remember much of what I did but I remember working on a character named Yoshi which was a dinosaur type creature that Mario rode. I worked on a lot of TV cartoons that year. I was involved with every Saturday morning cartoon series that NBC aired in the 1991 season. Wow that's amazing. Yoshi is an iconic character, and ironically the inspiration for Crash's dinosaur companion from Crash 3: Warped. To be clear I'm pretty sure that I got reference of the character provided by Nintendo through the studio I was working at. I adapted that initial design so the character could work in the animated medium. I also worked on a Sonic the Hedgehog series that year. Hi Charles Zembillas! My name is Cynthia and I'm an artist THANKS TO YOU! Spyro the Dragon was a huge inspiration to me. His design blew my mind when I was a child and so did the gameplay. To this day (I'm 22) I still enjoy playing the original trilogy. The same thing goes with Crash Bandicoot! What the orher companies have done to Spyro truly saddens me since I feel he isn't Spyro anymore. Anyway, I make a ton of fanart of your Spyro and it fills my heart with joy and nostalgia. If I ever get into the industry, one of my biggest dream would be to meet and maybe even work with you. That's all I wanted to say! Have a great day, Zembillas! Hi Cynthia. Thank you for your great message. I wish you good luck and success in everything you do and much happiness in life.